the gentleman called me with some concerns about doing this job on his own. Now don’t get the idea that we offer a free education with every reamer we rent, on the contrary its not unusual for us to tell a guy if he is not comfortable doing the work he should go to a competent gunsmith. But this situation got my attention, you see he was active on an online discussion forum. All the self proclaimed experts were scaring the pants off this poor guy. 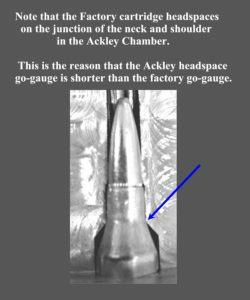 It seems that many shooters, and some gunsmiths are confused about the proper way to headspace an Ackley Improved cartridge. They were telling this would-be gunsmith that he had to set the barrel back to get a true “Ackley” chamber. Problem is that with rimmed cases this is not true, as long as the headspace for the parent case is correct and the new chamber will clean up the original chamber. Rimmed cases are headspaced by the rim being trapped between the bolt-face and the breech or rim-cut of the barrel. So, the shape or length of the chamber are almost immaterial with rimmed cases. As long as the case design will allow the case to be extracted the case can be much smaller than the chamber and it will fire-form just fine. Again, this goes back to the fact that the rim is the headspace limit for such cases. Left is 30-30 Ackley Improved. Right standard 30-30 Winchester. In the photo you can clearly see the rim at the head of the case. There is no reason that the barrel would need to be set back to get the chamber correct. This photo should make that easy to see, however later in this article we will discuss some of Ackley’s other designs and show where the confusion comes from. Similar to rimmed cases in headspacing are belted magnum cases. The case is designed to headspace with the distance from the bolt-face to the front edge of the belt, in the same way that the rimmed case is trapped. The 375 H&H AI is a good example of this. Just as the rim above holds the case during forming, here the belt holds the case while the body and new shoulder are formed in the improved chamber. Most of our magnum cases are modern enough designs that they do not benefit greatly from being “Improved”. Truthfully, most of the AI chamberings that clients request are either rimmed cases or rimless cases. The basis for most of the confusion about head spacing for Improved cases comes from the fact that the rimless cases do require that the barrel be set back to get a proper new chamber. The reason for this is really simple, Ackley was a pretty smart guy, he figured out that by shortening the chamber by .004” you would still be able to chamber factory loads but with his sharp shoulder and expanded body the only place the case would touch in the new chamber was the bolt-face and the junction between the neck and the shoulder of the case. 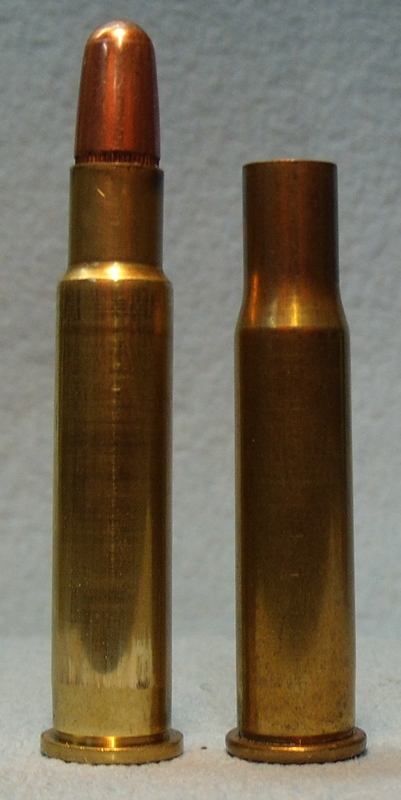 By holding the case tightly against the bolt-face in this way, the cartridge could be fired safely, allowing the brass to fire-form into the unsupported areas of the new larger than original factory chamber. 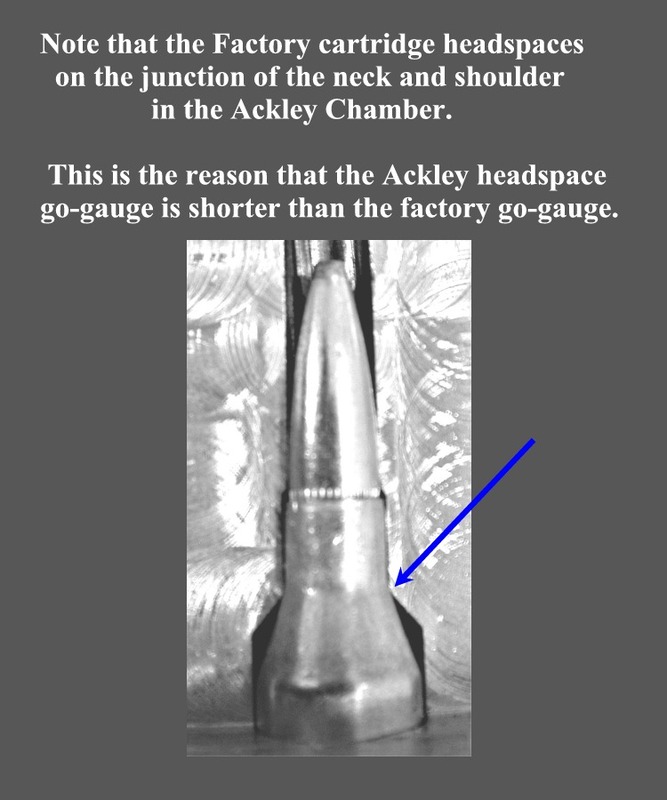 So the proper headspace gages for a rimless Ackley Improved chamber are a “go” gauge made for the specific Ackley caliber, and a “go” gauge from the factory caliber becomes the “no-go”. This works because the Ackley gauge is .004” shorter than the standard “go” gauge for the given caliber. Because such a small portion of the shoulder will actually be in contact with the shorter chamber the resistance one might expect is almost nonexistent. In order to make a perfect headspace job with a rimless Ackley Improved chamber you will have to set the barrel back one thread. There are added advantages to this process. It’s an opportunity to improve accuracy in the process. Since you will be resetting the headspace this is a great time to lap lugs and square the receiver face as accuracy modifications to the action. 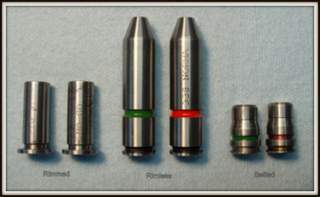 Factory chambers are often out of round, off center from the bore line, or oversized. As a result of the set back you can often clean up most of these problems and improve the accuracy of the finished rifle. Most important of all for the rechamber job to the Ackley design, the set back and rechamber will allow you to shorten the chamber to get the correct headspace measurement. If the barrel has no sights you can set if back a partial turn, then you just engrave a new caliber marking. Be sure to set the barrel back far enough so that you will actually be cutting a new chamber with your reamer, otherwise you might end up with a chamber with multiple steps, this is unsightly and unprofessional, your shooting buddies will notice poor workmanship causing you much embarrassment. shoulder of the case contacts that same junction in the chamber. Note the open area around the shoulder, when the case if fire-formed the brass with expand to fill all that space. Subsequently when you reload the brass you will have the added case capacity that makes “Improved” cartridges desirable. If a rimless case is rechambered using an Ackley Improved reamer without setting the barrel back the result is an undesirable wildcat. Factory ammo will have an excessive headspace condition in such a chamber. Firing factory ammo in such a chamber may result in case head separations, misfires, or at the very least short brass life. Such a chambering should be considered unsafe, as well as poor quality. What I want is blueprints for the Ackley Improved cartridges. Does this book have that?? Two books include data on Ackley cartridges. P.O. 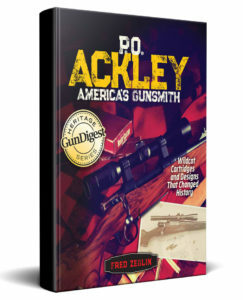 Ackley, America’s Gunsmith contains load data for many popular Ackley cartridges that is for current powders and much of it is pressure tested. There are three charts in the book that supply Ackley’s own dimensions for cartridges including his wildcats; not blueprints but all the dimensions you need. The other book, Chambering for Ackley Cartridges contains a chart of dimensions for Ackley Improved cartridges only. Both books are available autographed at the site below. If you need chamber prints the reamer makers all offer prints when you place an order.